Rockband "And Then She Came"
Nose: Malt comes first, followed by a little Turkish honey. 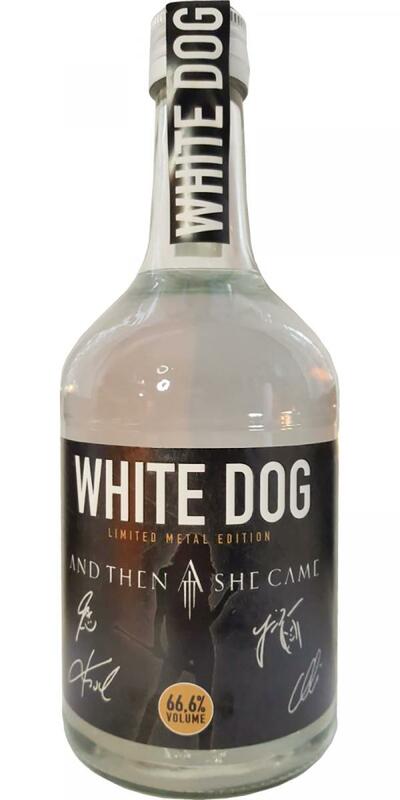 As with the White Dog with 63.5% hardly any alcoholic touch. White fruits, vineyard peach, fresh pear, also a little quince, bright, crisp apples. Six drops of water take out the barley malt, another six more drops, it comes a few ripe apples to it, the more water the less barley and this is gradually a little hospital corridor and disinfectant and a distant cardamom note. Mouth: there's some alcohol in it. Liquorice, little sweetened Turkish honey (that's how I imagine it), refreshing and soft and warmer. It is quite typical for a new make, but a very good one, if you dare to put 66.6% pure in your mouth, you will be pleasantly surprised by how soft and oily the feeling on the tongue is. Finish: short, but following the mouthfeel, warm and malty. I'm curious what's coming out of the barrel in a few years, you of St. Kilian are on a very good way with the White Dog! Conclusion: on the web you will find various cocktail creations. I have tried a Sour so far, but the New Make-character is very strong and that does not really fit my taste. Nevertheless, something that you can have at home, so far, all guests were surprised how good this unripe malt brandy is! Uih the rocks! Even stronger than the barrel-strong New Make by St. Kilian. Of course, the same malty and light-fruited profile but intense in the finish and the spicy (cumin?) Note is even stronger here. Great addition to the new-make range!